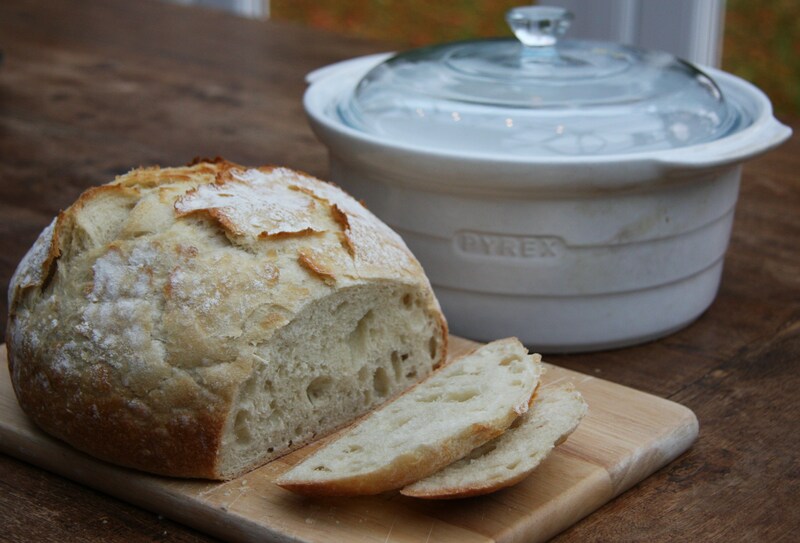 This is such a delicious crusty white bread and has a really unusual method. It has a slow, single rise and then is put into a hot casserole dish and straight into a hot oven. Thirty five minutes later you get it out of the oven and lift the lid to a golden, crusty loaf. I saw this recipe on one of my favourite blogs, In Pursuit of More. Check out the original post – Shira writes beautifully, takes amazing photos and posts delicious recipes. I didn’t manage to use the exact recipe as I didn’t have any dried yeast – I keep fresh yeast in the freezer in 15g portions. So I started out by weighing 3 cups of flour and seeing what sort of proportion it was of the 500g of flour I would normally use. I gave up with that when I realised that I would need about 900g of flour to use the 15g of yeast. So instead I used 500g strong white flour, 12g salt, 15g fresh yeast (7.5g dried yeast), and 325ml water. Mix the flour and salt and either add the dried yeast to the dry ingredients or the fresh yeast to the water. Add the wet ingredients to the dry, mix well and turn out onto the kitchen surface. Knead for about 10 minutes, until the dough is smooth and silky. The original recipe uses more salt and less yeast than you would normally expect and calls for a rise of 12-20 hours. I chose to speed up the process but use the same method. I’m going to buy some dried yeast and do the whole recipe again using cup measures properly just to see the difference – the longer you leave the dough to rise, the more the flavour should develop. I covered the dough and left it to rise, in a large, greased bowl for about 8 hours and it had at least tripled in size. At that stage I set the oven to 230°C and put the casserole dish in the oven to heat up. Turn the dough out onto a floured surface and shape in to a round loaf. It does not need to be kneaded, or left to rise again. Put it straight into the hot casserole dish, put the lid on and put it into the oven for 35 minutes. Don’t be tempted to open the lid before the time is up. When the bread is baked you will have a perfectly round, beautiful crusty loaf – absolutely delicious. The only problem that I can see with this recipe is that I would eat the whole loaf before it had cooled! That is in fact the main problem! Sounds fascinating. Was it your slow cooker pot? Am waiting to see your Christmas cake! I had the same problem, but once you get over it you won’t look back! It really is – and so easy! I tried it with a wholemeal type bread flour – easy & good. I think I need to use more oil in the bowl that it stands in though, it was very sticky in the morning & I had to pull it out of the bowl instead of turning it out. I think that made the bread more dense because it lost a lot of the air… but it was still good. Hi, really glad you were able to give it a try! It is a good idea to use quite a lot of oil in the bowl as that really helps. The other thing I find really useful is to go all round the sides, to the bottom of the bowl, with a plastic dough scraper – the dough will lose about half its height just doing that, and I think that’s normal – but then it will fall out of the bowl relatively easily when you invert it. It’s taken me loads of attempts to finally come up with that method and I find it the best but let me know if you can think of anything better!